Whether you're spending your Valentine's Day solo or can't decide what to do with your boo, these romantic movies are here to help. Love is in the air! Valentine's Day is approaching fast, and there's no better way to celebrate than to cozy up with your significant other, pet, or favorite snack and watch a romantic movie. The romantic film genre is incredibly diverse. From romantic comedies like "10 Things I Hate About You" to old Hollywood classics like "Casablanca," the choices are endless. So what influences a state's choice in romantic movie? Streaming Observer hints that your location might influence what movie you want to watch. Washington viewers loved "Sleepless in Seattle," Pennsylvanians can't get enough of "The Philadelphia Story," and Wyoming prefers "Brokeback Mountain," which was filmed there. Some films came out at the head of the pack as the most popular film in multiple states. Films like "Her," "Ghost," "It Happened One Night," "Sense and Sensibility," "Silver Linings PLaybook," and "The African Queen" made an impression on more than one state. The king of all romantic movies is "Titanic." It was the most searched for romance film in the U.S. "Titanic" also remains the second highest grossing film worldwide. 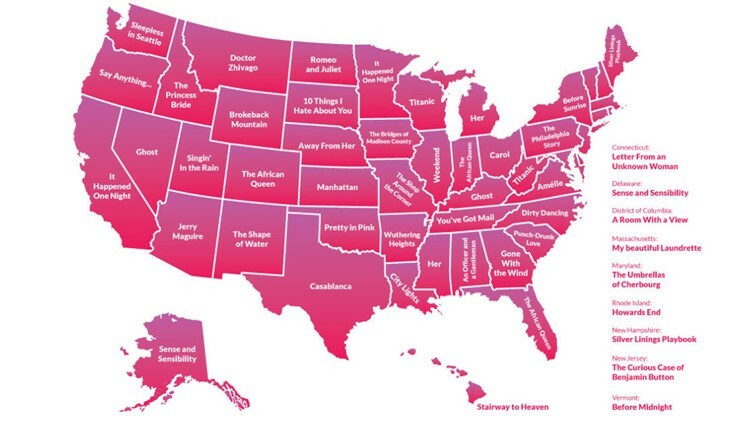 Not all states are romance movie fans though. When measuring interest in romance films in general, Streaming Observer noted that Mississippi was the least concerned with them, followed by South Carolina and West Virginia. If you're from one of those states and you're looking for a romantic movie date, you might want to move to New York, Massachusetts or California. 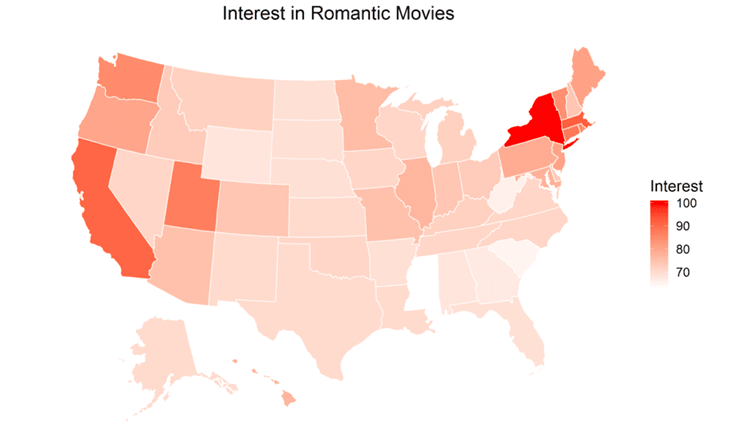 Those states had the highest interest in romance films. Check out the full list below to see if your favorite film lines up with your state's preferences, and check out some other states' favorite movies this Valentine's Day.